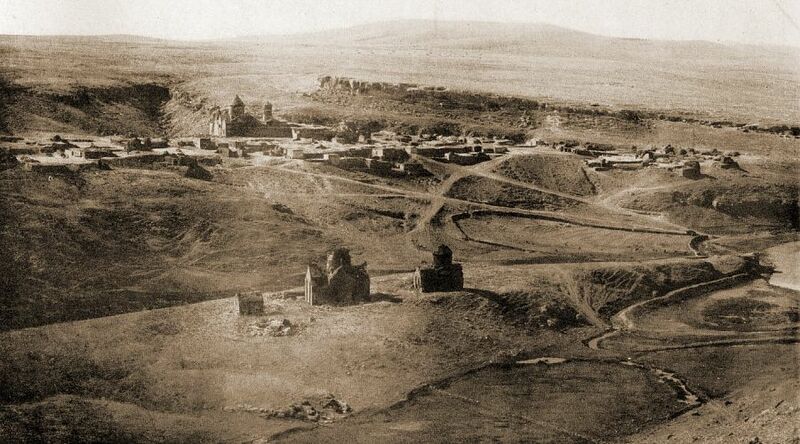 "The monastery called Horomos, which is in the district of Shirak, was built by Hovhannes, who was decorated with ornaments of mercifulness, for he distributed possessions mercifully and virtuously, to the point of giving away all of his clothes whenever he came across poor people. He intended it to be a resting place for passers-by and travellers, so that all strangers may rest as if in their own homes. The same token of mercifulness is still observed today in that monastery." 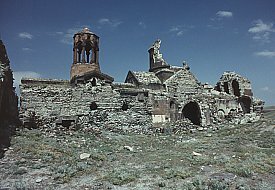 The monastery of Horomos is situated about 15 km north-east of Ani, beside the Akhurian river, and is reached by a rough track that runs close to the edge of the river’s ravine. 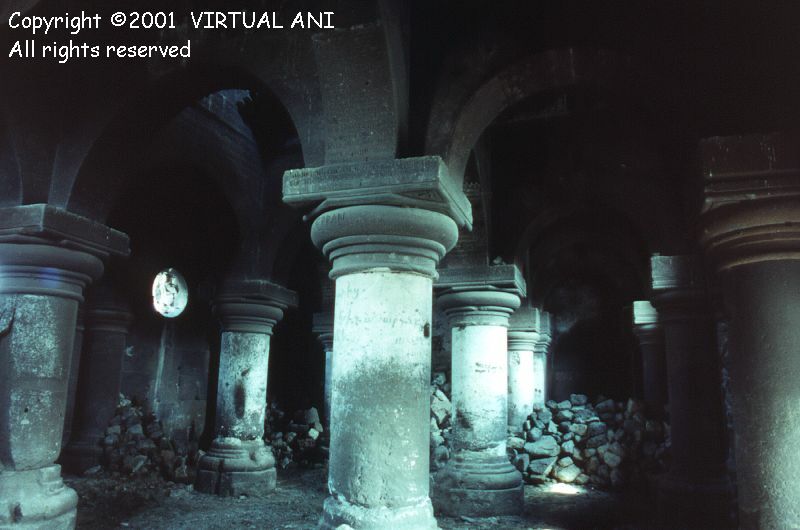 It was one of the most important religious and cultural centres within the Kingdom of Ani, and was founded during the reign of King Abas the first (943-953) - a period of monastic revival in Armenia. The words of Stephanos Ashoghik (writing during the 11th century) suggest that the monastery was originally built on a caravan route. The importance of Horomos increased greatly after 961, when the capital of the Bagratid kingdom was moved to Ani. The Bagratid kings turned the monastery into a royal burial ground. In 982 it was sacked and burned by Muslim invaders, but was soon restored and enlarged under the later Bagratid kings who built new chapels and churches. 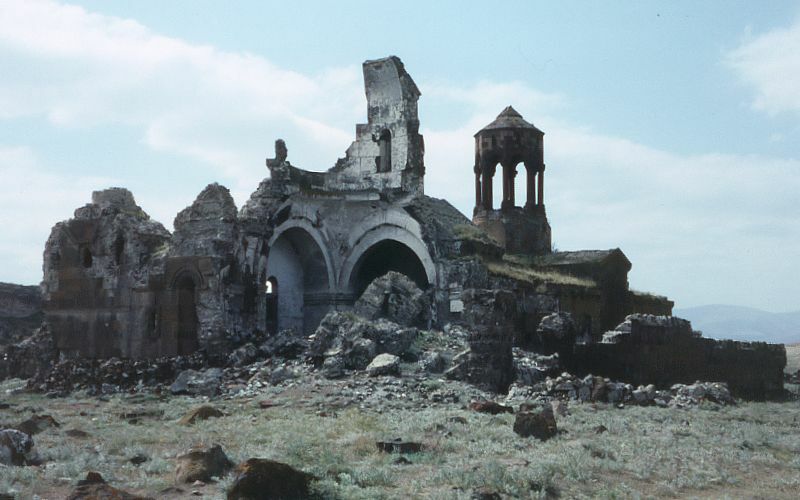 The immediate history of the monastery after Ani's capture by the Turks in 1064 is unknown. After a break, donative inscriptions on the buildings begin to reappear as early as 1174, and a manuscript from the 1180s describes it as a renowned religious and cultural centre. Horomos became an important burial place for the feudal families who governed Ani on behalf of the Mkhargrdzeli dynasty, the rulers of the Ani region during the 13th century. 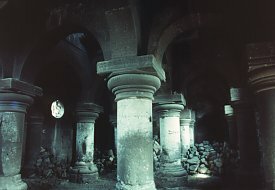 The monastery had a large library and an active scriptorium, and it is believed that the archbishops of Ani and northern Armenia sat here. The latest dated inscription from the medieval period at Horomos is from 1336. From then, the history of the monastery is not known until the late 17th century - and it may have been abandoned for part of this period. In 1788 the monastery was renovated, the circuit walls restored, and the cupola bell tower built (or rebuilt). The traveller John Ussher visited Horomos in the early 1860s and found it to be in a derelict condition, with only one monk in residence. Further renovations and restorations took place in the years 1852, 1868, 1871, and 1878. 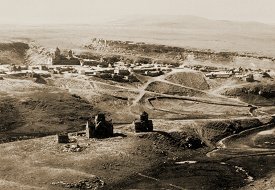 Many of the visitors to Ani during the 19th century (including H. F. B. Lynch) stayed at Horomos, and the monastery continued in operation until 1920. During the Russian period a village surrounded the main part of the monastery - but the site is entirely deserted today. There has been substantial damage to the monastery since 1920. Some buildings have entirely vanished, and most of the surviving walls have been striped of facing masonry. 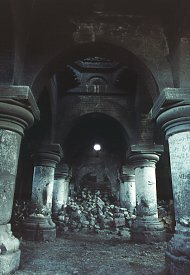 The dome of the Church of the St. John collapsed in the 1970s. Gaining access to the monastery, which was never easy, is now virtually impossible. 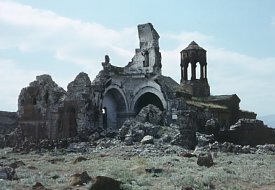 Horomos monastery was also known as Ghoshavank. The origin of these names has not yet been adequately explained. 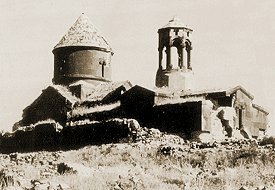 13th century Armenian writers believed Horomos to have been founded by monks fleeing from the Roman (i.e. Byzantine) empire, and that its name was derived from that event and meant "of the Romans". 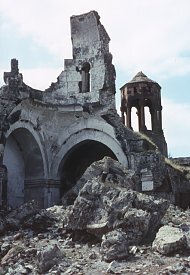 A similar explanation was said to account for the name Hromkla, the castle in Cilicia that was the seat of the Armenian patriarchate during the 12th and 13th century. 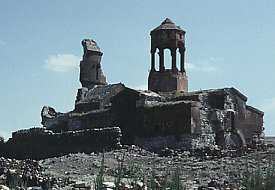 The monastery comprises two separate groups of structures. The main part of the monastery lies within a fortified enclosure that occupies the highest part of a peninsula, at the edge of cliffs above the Akhurean / Arpa river. Below and to the north of the main complex is a row of three churches built on a rise in the ground and encircled by a dried-up meander of the river. There are other remains near the monastery. 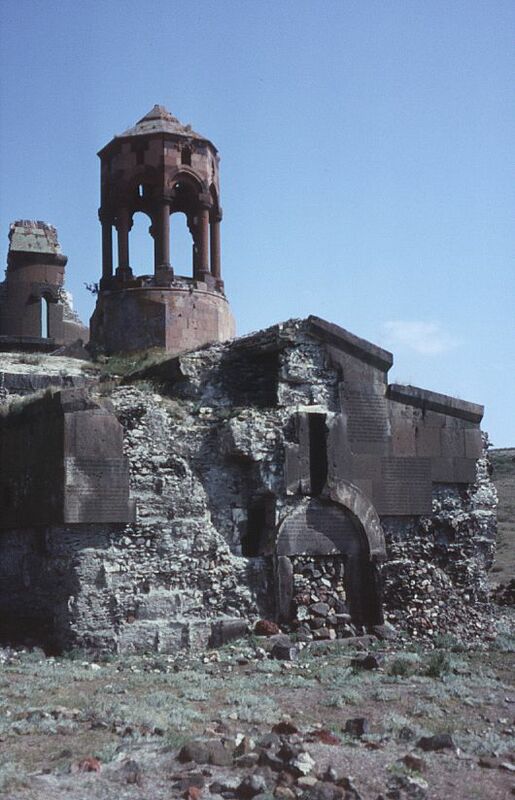 About 500m to the north, overlooking the monastery and built on the route to Ani, is a structure known as the "triumphal arch". 2km to the north of monastery stands an isolated church whose original name is unknown. It is now known as the Taylar church (named after a nearby village) and is probably from the 10th century. The main complex occupies a rectangular area enclosed within a circuit of fortified walls. Only fragments of these walls now remain visible. The entrance to the enclosure was at the western end of the north wall. To the right of this entrance was sort of extension to the wall, into which several large and extremely ornate khatchkars had been set. 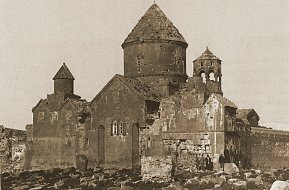 Unusually for khatchkars, they all faced north. They are all now destroyed. Within the enclosure wall, two groups of now ruinous buildings still survive. The first group is built around the church of Saint John - the principal church of the monastery. Its outer hall or zhamatun is now the most prominent surviving building at Horomos. The second group, known as the "house of the relics" stands to the south of the first. A wall once ran in front of the zhamatun, turning the area around the enclosure entrance into an outer courtyard. Within this outer courtyard was a building thought to have been a hostel for guests, and, along the southern edge of the enclosure, a row of cells used by the monks. Both these structures were in ruins by the start of the 20th century, and are now entirely gone. 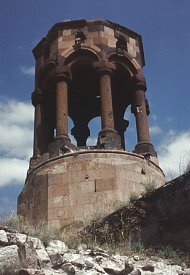 "In the 487th year of the Armenian era (1038) I, Hovhannes shahanshah, son of Gagik shahanshah, donated my orchards in Kulp to my church Surb Hovhannes, which I built with this zhamatun in the monastery of Horomos. Also I granted one hundred loads of salt each year, free of all duty, during the patriarchate of lord Petros and the prelacy of this congregation of father Hovhanness. Now if anyone after us opposes this decree and my grant - he shall be responsible for my sins before God, and shall be cursed in life and in death by the 318 patriarchs who gathered at Nicea. And those who abide by this decree shall be blessed by Christ." 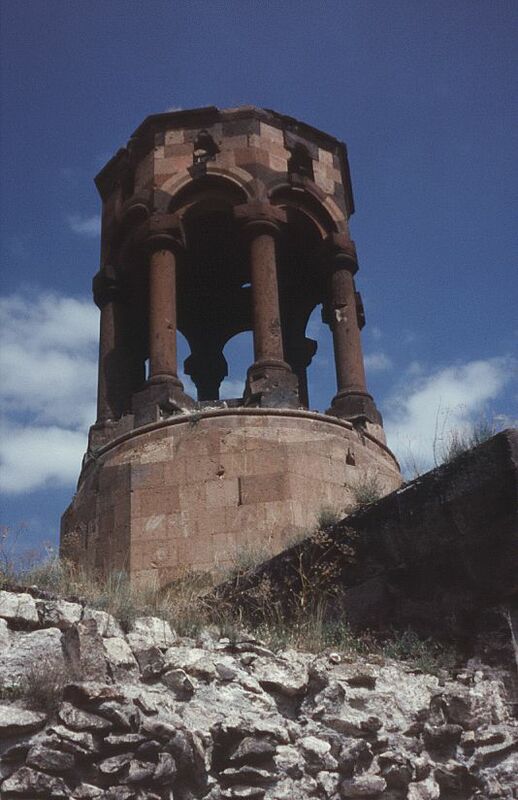 The Hovhannes mentioned in the above inscription is King Hovhannes-Smbat, ruler of Ani between 1020 and 1042. The church of Saint John, the main church of the monastery, was a rectangular domed-hall type. The semicircular dome had a cylindrical drum supported by pendentives, and had a conical external roof. The interior was very plain - however, there were traces of paintings, probably from the 13th century. There were twin windows in the apse, an archaic feature generally found in much earlier churches. The exterior wedge-shaped niches in the north, south, and east facades indicate that the church was intended to be a free-standing structure, unencumbered by the later additions. The absence of these niches in the west facade, together with the very plain appearance of the western doorway, suggest that the zhamatun addition was intended from the outset. 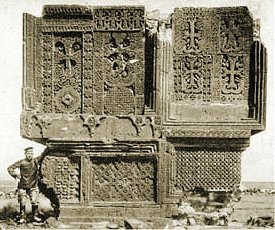 Starting during the 10th century, but mainly from the 13th century onwards, zhamatun extensions began to be added to the western end of Armenian monastic churches. The word zhamatun means "church-house" and they were used as meeting places and as a place to bury the dead (it was forbidden to have burials inside churches). 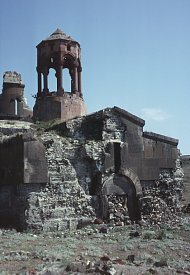 The zhamatun of the church of Saint John is the most important surviving structure at Horomos, and it is a significant building in the history of Armenian architecture. It is a very early example of a zhamatun, being constructed at roughly the same time as the church and before the 1038 date mentioned on the doorway inscription. It also has a quite exceptional plan and decorative features for this time period, as it is of a design type common from the end of the 12th century. The roof of the zhamatun is supported by rows of heavy, round arches. These cross the room in both directions and are carried on four massive columns. These columns are thick and squat, have plain, bulbous capitals and bases, and rest on octagonal plinths. The arches divide the ceiling into nine rectangular compartments. The arches over the central axis are taller, giving the interior an east-west emphasis and the appearance of a central nave flanked by aisles. 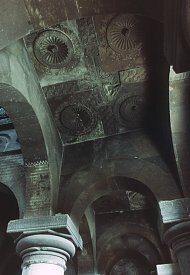 The ceilings over the "nave" are flat octagons, with the transition from the square bay accomplished via squinches. For the middle compartment the flat ceiling is replaced by an octagonal pyramidal vault ending in an oculus skylight. The oculus is capped externally by a lantern dome set on tall, slender columns. This lantern served as a bell tower. 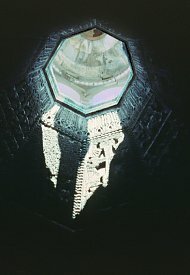 The pyramidal vault resembles an eight-sided funnel, and the flat surfaces of this funnel contain a set of very richly decorated panels, covered in sculpture in low relief. The panel facing east is the most interesting. It is divided into two sections. On the upper half, God is depicted seated, framed by an arched canopy, (Lynch identifies this figure as that of the Virgin Mary). On either side of His head is an angel, and beside Him are depicted the symbols of the four Evangelists: an eagle, lion, bull, and human. In the lower half of the panel are two rows of four human figures - an inscription between the rows identifies the upper four figures as representing Saint Gregory the Illuminator, his two sons Aristakes and Vrtanes, and Yusik, the son of Vrtanes. The ceilings to the north and south of the central aisle are flat and are also richly decorated. In the centre of each ceiling is a cross whose head faces east. 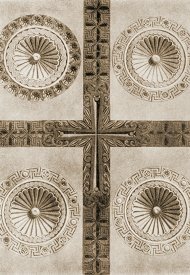 Between the angles of each arm of the cross is a bowl-shaped rosette incised into the stone and framed by a concentric moulding. The interior of the zhamatun is now very dark and gloomy, due to the blocking of all the windows and most of the doors (the building is now used as a shelter for sheep). 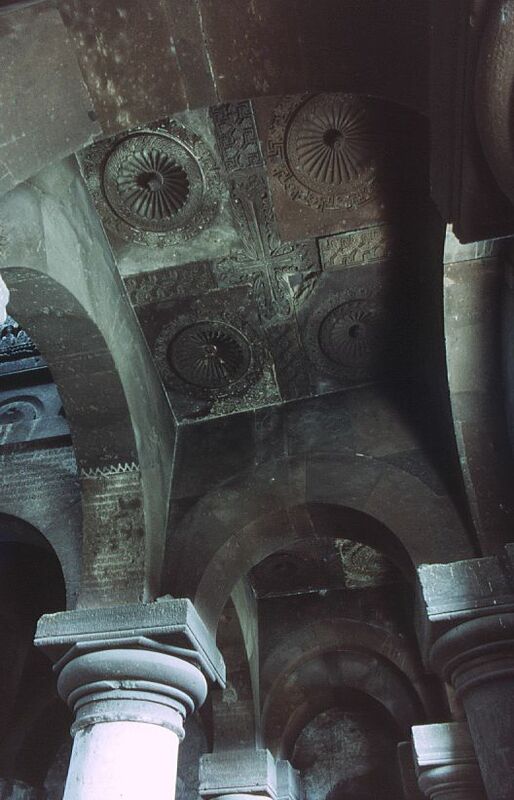 The walls and arches are covered in Armenian inscriptions, particularly under the lantern. ...forward to the second page on Horomos. 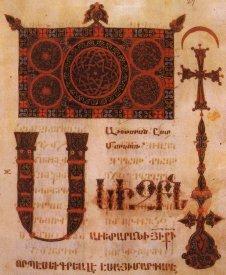 This page [Horomos Monastery] was first published on the 6th February 2001. It was last revised on the 9th November 2004.